Come and escape to the splendour of Chiang Rai in Thailand's northern province. It's only 182 kilometres (113 miles) from the main tourist town of Chiang Mai. The town borders the countries of *Burma to the north and Laos to the east. Someone once said that it's the journey and not the arrival that really matters. This far northwestern town was the first capital city of the Lanna Thai Kingdom and one of the oldest towns founded in 1262 by King Mengrai who also built Chiang Mai in 1296. Chiang Rai was occupied by Burma from 1558 until 1774. Thereafter, it became part of Siam once again and now known as Thailand today. With only a population of around 60,000, this is the perfect place to be should you want to get away from the crowds and be in a more relaxing atmosphere. Apart from the mild climate and the wonderfully friendly locals, there are a variety of attractions as well as beautiful surroundings to indulge yourself. From the city, you can venture out on several day trips that are on offer. For the record, there are 12 national parks and 26 waterfalls, dozens of interesting temples, including one that has some very unusual art and then some. There is a wonderful night bazaar with many handicraft stalls and a variety of restaurants serving fabulous local Thai cuisine. An excellent time for shopping. *Burma is the name previously used for the country now known as Myanmar. I always refer to the country as Burma due to my political views and my heartfelt sincerity of a country once ruled by a small minority of vicious military juntas who reigned terror on its many peace loving inhabitants. The military junta were the ones responsible for the new name change. As of 2012 Burma was in the process of becoming a true democracy and the rest, as they say, is history. Read here to find out what it's really like to be a tourist in Chiang Rai and also what it's like living here as a foreign expat or retiree. Why go, what to expect, what to see and what to do. A tour of North Thailand's surrounding thick forests and mountainous terrain will uncover some fascinating insights to the Hill Tribe people who live here. For its certainly one of the highlights when visiting this neck of the woods. There are many hill tribes in northern Thailand who maintain their traditions by using their individual identities through their distinct language, culture and a variety of colourful costumes. Their handicrafts include some very intricate embroideries and weavings which you'll find on sale at many of the markets in their villages. Hill Tribe is a term used in Thailand to describe the numerous tribal people who originally migrated from China and Tibet over the past few centuries and who now inhabit the remote northern borders of Thailand. There are several leading hill tribe families living within the northern borders between Laos and Burma. These tribes are commonly known as Akha, Lahu, Hmong, Mien, Yao, Karen and Lisu. But there are also a few lesser known hill tribe families living in the area too, namely Khamu, Thins, Palong, and Mlabri. 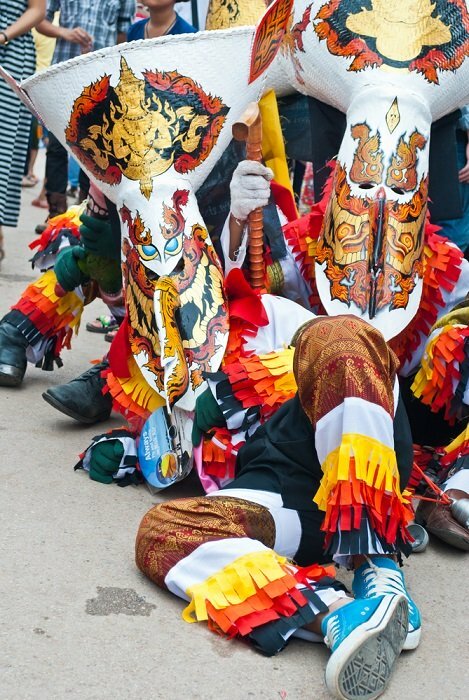 Discover the highlights of Chiang Rai’s culture and history on this daylong private tour with a professional guide. Check out stunning teakwood buildings, temple artefacts and botanical gardens at Mae Fah Luang Art and Cultural Park. You'll see items used by Thai royalty at the Oup Kham Museum. You'll see modern and artistic Wat Rong Khun, also known as the White Temple. You'll sample delicious northern Thai food at a local restaurant and check out the bountiful offerings at the central market. 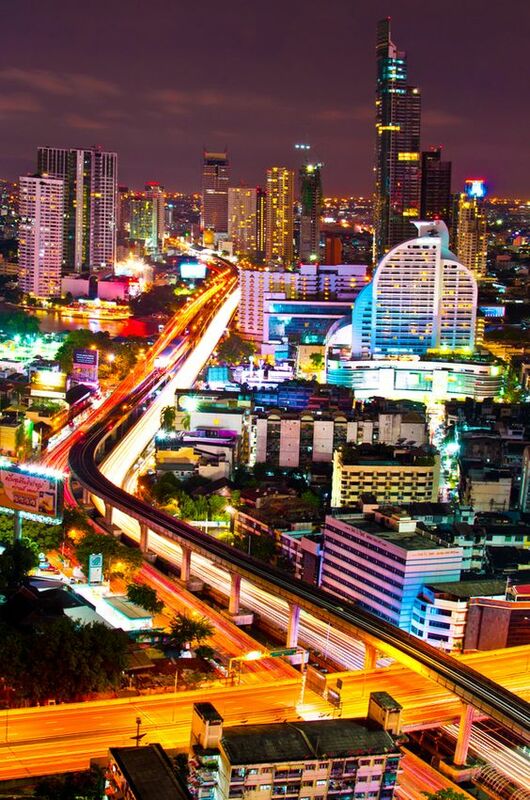 You’ll also gain an insight into northern Thailand’s rich culture as you get to know this fascinating city. For more details on this tour, see link above. Disclaimer: Booking your tour from this page (at no extra cost to you) would not only see a little extra cash coming my way but you'd also be helping me maintain this website so that I can continue giving you more Luxury Thailand Travel information. Many Thanks. Wat Rong Khun Temple is so vastly different from all the other temples that I came across in Thailand. One of the first things you notice about this particular temple is that of its unusual colour. It's completely white. While the white colour of the buildings signifies the Lord Buddha's purity, the same colour white used in some of the glass windows, signifies the Lord Buddha's wisdom. Inside the temple, you will see many murals and paintings depicting images of the lord Buddha while outside the temple you will see lots of strange white limestone sculptures. Some are adorned with tiny pieces of mirror permitting the building to shine and sparkle in the sunlight. It may be necessary during this period to wear a good pair of sunglasses as the glare can often be quite intense at times. 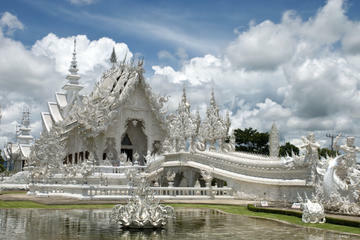 Best of all, the temple of Wat Rong Khun is surprisingly close to Chiang Rai. You would only need to travel south of the city for about 15 kilometres (9 miles). Once you get here you will experience the peaceful atmosphere that prevails. Both the temple and artworks are designed and constructed by one of Thailand's most renowned artists and architects. His name is Chalermchai Kosipipat and he tells me that the entire complex is only expected to be completed about 90 years from now. The reason for this he says is that a total of nine buildings will be built altogether and this will take some time to finish. Chalermchai seems to have his entire lifetime career all mapped out which will no doubt, keep him busy for a very long time and then some. The project was originally started in 1977 as a lifetime project and Chalermchai now wishes to dedicate the project to King Phumiphol who is the present king of Thailand. The artist can be seen here every day, giving instructions on the site, so there is a good chance that you might even be able to have a chat with him. He is also busy training many other artists, architects, designers and painters to continue his work long after he's gone. I was wondering if I should apply for a position. The only other building that I've had the pleasure of visiting during my many travel escapes abroad, and which is still under daily construction since its inception in 1881, is the beautiful Sagrada Familia, a Roman Catholic Church in Barcelona, Spain. It is said to be another 100 years in the making. The Spanish architect, Antoni Gaudi was largely responsible for its design and construction. It was Gaudi, who inspired Chalermchai Kosipipat. Wat Jet Yot Temple is a site which houses a large gilded seated Buddha as well as an impressive astrological fresco on the wooden ceiling of the main building.